Driven by widespread mobile network operator (MNO) adoption, the next-generation wireless technology known as long-term evolution (LTE) by 2014 will have more than nine times as many subscribers as its main rival in the 4G market, Wireless interoperability for microwave access (WiMAX), according to new IHS iSuppli research. Worldwide LTE subscribers will rise rapidly during the next two years, and in 2012 will surpass those of WiMAX, the current leading 4G air standard spearheaded by the U.S. telecom operator Sprint. In 2014, LTE subscribers will reach 303.1 million, compared to 33.4 million for WiMAX. 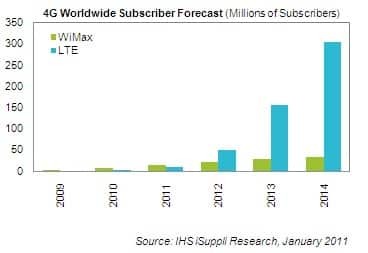 WiMax subscribers worldwide are expected to top 14.9 million in 2011, up from 6.8 million last year. In comparison, global subscribers in 2011 on LTE—championed by most tier-one MNOs globally, such as AT&T Inc. and Verizon Wireless in the United States, as well as Vodafone and TeliaSonera in Europe—are projected to reach 10.4 million. But while that total is smaller than WiMAX numbers, it reflects an astonishing leap from just 702,000 users in 2010 and virtually zero in 2009. Although the International Telecommunications Union has announced that neither LTE nor WiMAX are officially 4G technologies, industry vernacular has adopted the designation for both. Regardless of how they are categorized, this set of next-generation mobile wireless standards is characterized by very high data-transmission speeds, flexible width channelization and perhaps, most importantly, low-latency packet transfers. As is normal for the industry, while older wireless technologies such as 2G and 3G continue to be in use in every part of the world, the transition to higher-speed broadband networks is under way, and the race is on to determine which 4G technology will provide the expected performance and enhancements from day one. At the recently concluded Consumer Electronics Show in Las Vegas, Verizon Wireless used the event as a platform to officially introduce 10 LTE devices from four different original equipment manufacturers, utilizing four different core-chipset partners. Of the 10 new devices, three were media tablets, four were smart phones, two were notebooks and one was a mobile hotspot. The new entries beefed up Verizon’s previous LTE lineup of two USB dongles introduced last quarter. An estimated 10 LTE operators worldwide have launched to date, and more than 30 new operators will start LTE services this year, IHS forecasts. For WiMAX, the majority of operators can be found in Europe, followed by the Asia-Pacific region, the Middle East and Africa and then the Americas.